Catch your first wave with help from the pros at Aqua Surf School. Santa Monica’s sand bottom, beach break and steady wave provide ideal conditions for beginning boarders. The constant sunshine and water temp in Santa Monica aren’t too bad either! Aqua Surf offers soft foam boards and wet suits along with an encouraging brand of instruction. Whether you’re a total novice or looking to step up your skills to the next level, Santa Monica surf is a fun water activity the whole family can enjoy. Aerial outings with Marina del Rey Parasailing offer adventurers unrivaled views of Santa Monica Bay. Soak in the Southern California sunshine as you soar serenely above the water at your choice of 500 or 800 feet. Flights can accommodate two or three people, so grab a friend or family member for extra fun—no experience necessary. 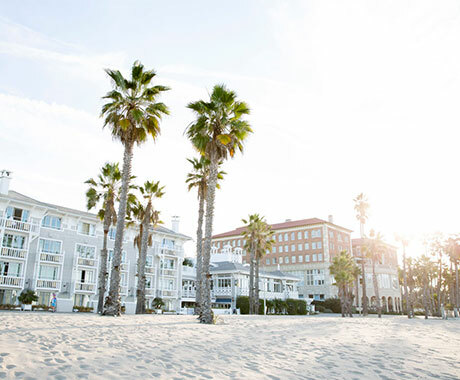 Breathtaking sights include Malibu, Venice Beach, and the Santa Monica Pier, as well as dolphins, whales and seafaring vessels. Another fun water activity in Santa Monica is paddling at one of California’s most beautiful beaches with Poseidon Paddle Boards, which offers stand-up paddleboard lessons with world-class instructors. First-timers learn the basics in tranquil flat water, then graduate to navigating the warm ocean waves. The shop also offers a broad selection of boards and accessories, with experts on hand to help guide students to their ideal gear. 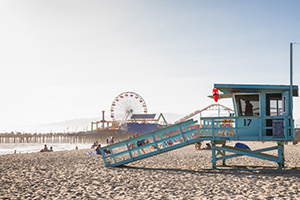 Average ocean temperatures in Santa Monica range from 54°F – 61°F in early February to 63°F – 70°F in early September. Check water safety conditions and the water temp in Santa Monica at ph.lacounty.gov/beach. 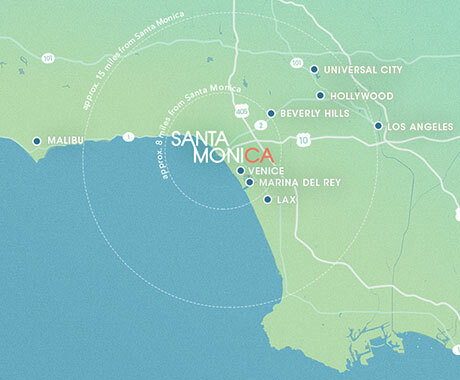 Not ready to try the Santa Monica surf? Skate, bike, and board rentals are available just north and south of the Pier, and at six Perry’s Café and Beach Rentals locations along the bike path. 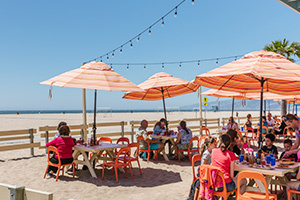 Fuel up for your water adventures at Back on the Beach Café or Perry’s Café, where you can nosh with your toes in the sand. Even on overcast mornings, be sure to liberally apply waterproof sunblock with a minimum SPF of 30 and reapply often.